Critically acclaimed interactive graphic novel about an elderly couple who volunteers for a visionary rejuvenation procedure. Due to a terminal complication, the couple is faced with severely disfigured, yet intellectually superior clones. With fluid navigation, interactive 3D and dynamic music, Upgrade Soul tells the story of Hank and Molly Nonnar, wealthy science buffs who decide to fund a risky, experimental therapy to rejuvenate the human body, with only one condition: that they be first in line to receive it. When dangerous complications develop… the battle for psychological dominance begins. When the procedure experiences a fatal complication, the couple is faced with severely disfigured, though intellectually superior duplicates of themselves. Soon, it becomes clear that only one version of each individual can survive, and a psychological battle for dominance begins. 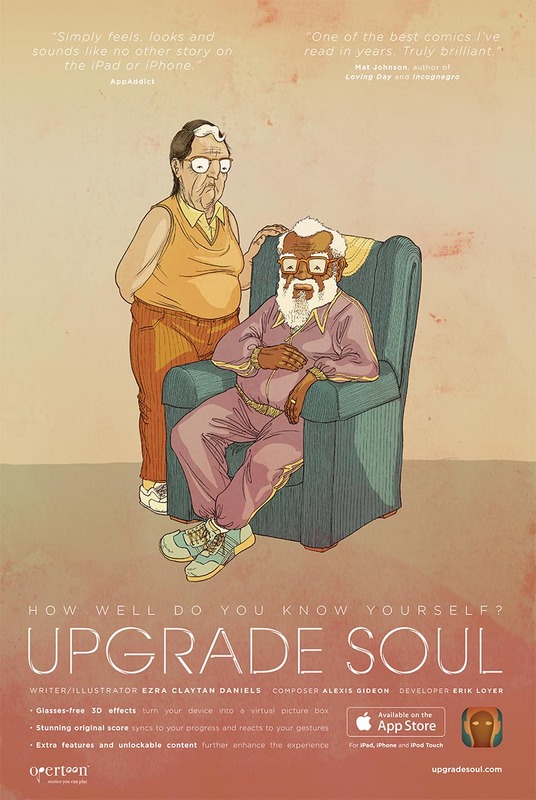 Upgrade Soul was published in print in 2018 by Lion Forge. The Upgrade Soul app is an immersive version of the science fiction graphic novel written and illustrated by Ezra Claytan Daniels. Featuring an original score by Alexis Gideon and interactive design by Erik Loyer. The iOS app is currently not supported by iOS 11 and above. – 3-D effect turns your device into a virtual picture box. – Stunning original score by experimental hip hop luminary Alexis Gideon syncs to your progress and dynamically reacts to your gestures. – Extra features and unlockable content enhance an already uniquely immersive reading experience. Ezra Claytan Daniels is a writer and illustrator based in Los Angeles, CA. His critically acclaimed graphic novel series, The Changers, began a unique career peppered with a number of collaborative multimedia projects ranging from video games to animation to feature documentaries. He has worked on several interactive projects with esteemed interactive artist Erik Loyer. His most recent collaboration, The Golden Chain, an animated short film with experimental video artist Adebukola Bodunrin, has screened internationally and was acquired by The Whitney for their permanent collection. Ezra’s graphic novel, Upgrade Soul, began life as a pioneering immersive serialized graphic novel for iOS in 2012. Upgrade Soul has been frequently featured on the Apple App Store, was named a 2013 IndieCade Finalist, and has been exhibited at The Hyde Park Art Center, the Wexner Center for the Arts, the Museum of Contemporary Art Chicago, the Fantoche International Animation Festival in Baden, Switzerland, Haarlem Stripdagen in Amsterdam, and the Fumetto International Comics Festival in Lucerne. Upgrade Soul was released as a single-volume graphic novel by Lion Forge Comics in 2018. The graphic novel BTTM FDRS, written by Ezra and illustrated by Ben Passmore, will be released in the summer of 2019. Ezra Claytan Daniels is the winner of the 3rd Annual Dwayne McDuffie Awards for Diversity in Comics. He is the co-founder of Screendiver and author of its Digital Comics Manifesto.